Azure App Service is a fully managed compute platform that is optimized for hosting websites and web applications. Customers can use App Service on Linux to host web apps natively on Linux for supported application stacks. The Languages section lists the application stacks that are currently supported. Check the Azure Status Dashboard. The Azure portal shows only features that currently work for Web App for Containers. As we enable more features, they will become visible on the portal. App Service on Linux is only supported with Basic, Standard, and Premium app service plans and does not have a Free or Shared tier. You cannot create Web App for Containers in an App Service plan already hosting non-Linux Web Apps. Based on a current limitation, you cannot mix Windows and Linux apps in the same resource group. When your application fails to start or you want to check the logging from your app, check the Docker logs in the LogFiles directory. You can access this directory either through your SCM site or via FTP. 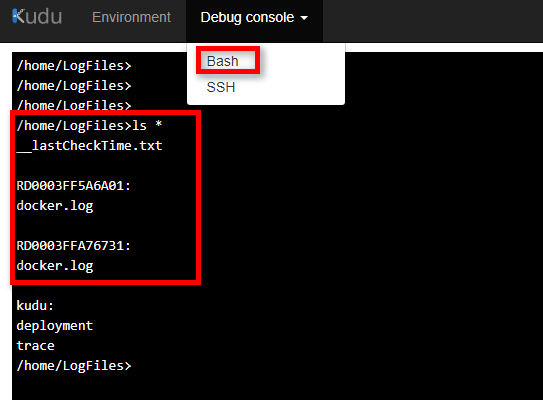 To log the stdout and stderr from your container, you need to enable Docker Container logging under Diagnostics Logs. The setting takes effect immediately. App Service detects the settings change and restarts the container for you automatically. You can access the SCM site from Advanced Tools in the Development Tools menu. You can post questions and concerns on our forum.